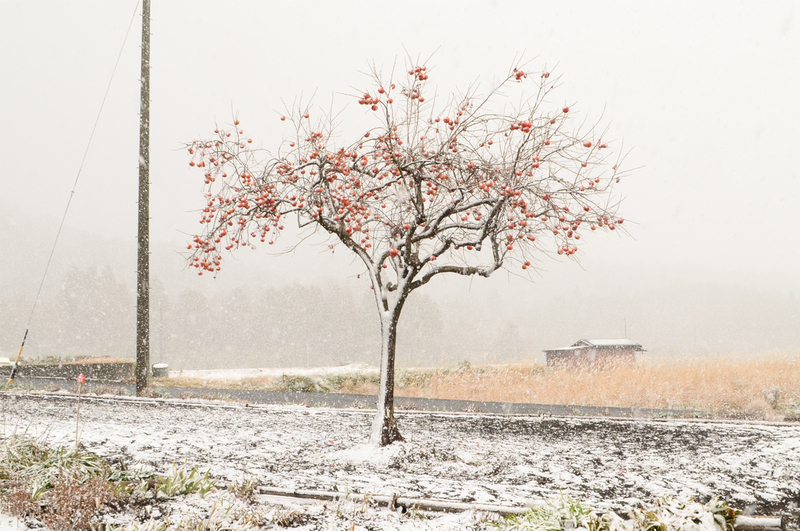 I watch the snow dust the battlefield in Sekigahara, Gifu, where two armies once fought at the climax of an epic war that would change the history of Japan forever. It’s so easy to feel like I’m there. I’ve climbed up a small mountain, against the winter cold, to stand in the same spot Ishida Mitsunari did when he knew he had been defeated. If I close my eyes, I can hear the distant cries of Tokugawa Ieyasu as he establishes the beginning of a legacy that will last 250 years. I could stand here forever, but I don’t. What do an ancient battlefield, an atmospheric hot spring and a historic temple town have in common? Besides all being in Japan, they were all places where I learned not to overstay my welcome. When I travel I like to think I do so without any care. The reality is that I’m stressed. Stressed I won’t be able to see it all. That I’ll find out only after I left that I missed seeing something. That I haven’t felt everything I was supposed to feel. As a result, I spent many years overstaying my welcome when I travelled. I defiantly pushed my limits in order to explore every temple, shrine, battlefield, castle and garden, just so I was certain I’d have no regrets. This resulted in being too exhausted to really enjoy anything. I circle around the hot water source in Kusatsu, Gunma for a third, maybe fourth time. All the while the shutter on my camera is clicking, capturing every angle as the sun sets, filling my memory card with hundreds of pictures that look exactly alike. I know I’m not enjoying myself but I can’t stop. I’m addicted to capturing this moment because time is never on my side and all too soon the sun will set and I will have to leave. I’m forcing myself to enjoy. And it’s not working. On vacation we are supposed to relax and unwind. 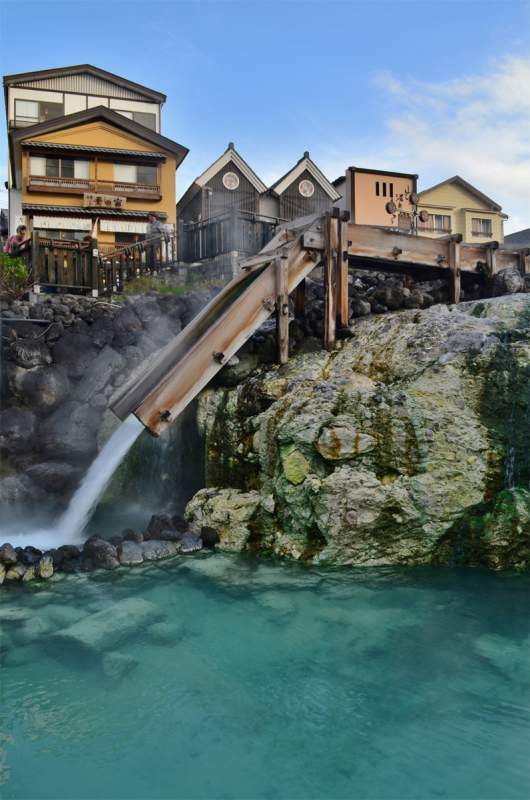 In fact, that was the nature of my trip to the Kusatsu-onsen hot spring deep in the volcanic mountains of Japan. The whole idea was to go to the town centre, see the sulfuric origins of the hot spring, and watch the bath ladies cool the water with massive wooden paddles as they did in ancient times. After a dinner of local foods at an old-fashioned inn I’m supposed to sink into a hot bath of my own and let my worries ease away. It was supposed to be my reward after a long week at work, and instead, all I can do is worry that I won’t have enough time to enjoy it all. It isn’t until the next day, when I drive up the steep windy road to Mount Shirane, that I’m so struck by the beauty that I at last lower my camera and take in the sights past my viewfinder. The crater is filled with milky turquoise waters that contrast sharply against the red volcanic rocks. Beyond the peak, a sea of clouds reminds me that somewhere out there, two kilometres below, lies the rest of Japan. I want to see it all, but for now I’m satisfied by this moment. For three years I lived in Japan. It was supposed to be only one, but after the first year I knew I hadn’t seen all I wanted to. In the beginning it was all a rush. I wanted—no, needed—to see it all. Every weekend trip when I wasn’t working, I was forcing myself to go and explore, sometimes spending only moments at a famous sight, and then wondering why I hadn’t truly enjoyed myself. It wasn’t until the second year that I realized I was “doing” travelling too fast. It took the third year to realize another travel lesson; I was occasionally overstaying my personal welcome. In an effort to take it all in, I began compensating for having spent my first year going too fast by now staying too long. I would ignore boredom as I sat on the edge of a pavilion, contemplating a rock garden and convincing myself that this was how true travellers did it. Finally, after three years, on my last adventure, I suddenly understood the secret to travelling: knowing when is when. It’s all about finding the sweet spot of staying the perfect amount of time. 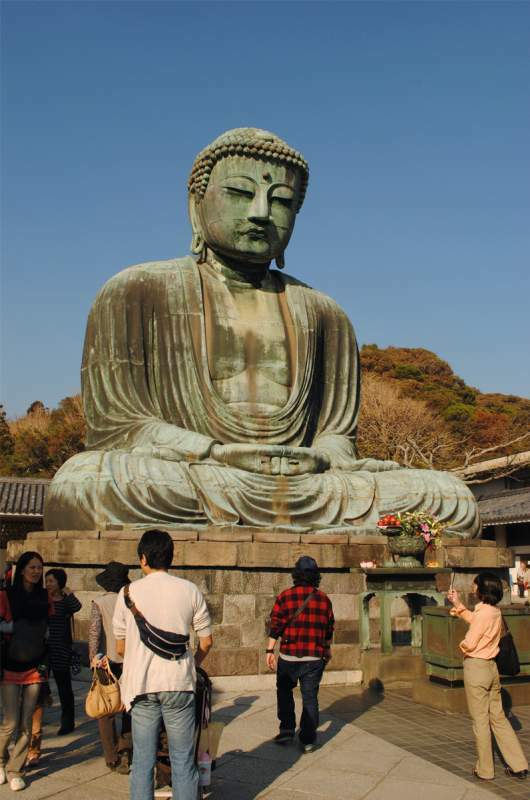 Kamakura is a historic town of temples in Kanagawa, just an hour south of Tokyo. It’s easy to forget that bustling metropolis though, with Kamakura’s peaceful shopping lanes, the line of cherry blossoms leading right through its middle street to the shrine, and the tranquil temples where I sit and watch the koi fish swim in the sun-warmed waters beneath the earliest blooming cherry trees. This visit is so different than my first one. The first time, three years before, I rushed about determined to see most of Kamakura’s 84 temples and shrines (there are actually more, as some shrines don’t have major significance and are not factored in the total). 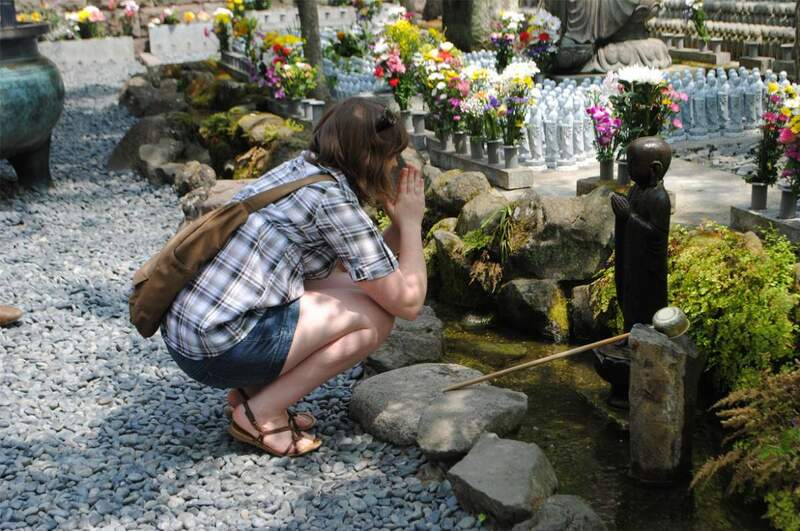 I went to countless temples, rang plenty of bells, prayed at numerous altars and collected fortunes and charms. I went to a shrine in a cave, one atop a mountain and one through a rock tunnel. But I couldn’t tell you anything about them for I whipped through so fast I didn’t bother to read any of the information posted; nor did I care, as long as my memory card was full. Not until three years later, when I’ve selected my two favourites, Hachimangu Shrine and Hasedera Temple, to return to do I understand where I went wrong. Finally I’m not in a rush. I enjoy every moment and take long pauses to soak it all in, but not so long as to grow bored. I leave my camera mostly in my purse and let time fall away. And the most surprising thing happened. When I’m finished, I think my whole day is gone, for I’ve enjoyed myself a whole day’s worth; but no—it’s only noon! Without a watch and a camera or pressure to see it all, my time at last reflects my enjoyment. I could stay longer and sneak in a few more temples—but why? I’m content, and don’t want to spoil the memory by forcing myself to see more. It’s still snowing out over that frozen battlefield in Sekigahara. With hundreds of places marking different fights and grave markers telling me about fallen warriors, I could spend the whole day here exploring it all. Only I don’t need to. I’ve come all this way and found exactly what I needed without forcing myself to stay just for the sake of travelling. I’m content to head home in the early afternoon, something I’d never dream of doing three years ago. Three years ago I had to pack everything possible into my time, and if I ran out of things to do I’d find things to do, even if I didn’t enjoy them. It’s easy to get caught up while travelling on formulating a mental checklist of things that need to be seen and done instead of things we want to see and do. It turns out, I don’t like sitting by rock gardens and contemplating the meaning of life—so now I don’t. I had to learn these things not only about myself but about time. I had to be content with the time I had, and learning when the perfect time was to say good-bye. Three years after arriving in Japan to the blooming cherry blossoms, I am leaving just as the first of the petals fall. As an English teacher I could have renewed my contract, and almost did, but I was content with what I’d seen and experienced. To stay longer could have risked turning a sweet experience into something bitter. I never wanted Japan to get boring. I knew when was when, and preserved an image of my travels as a result. This was Sarah Bruce’s first feature for Outpost magazine. Sarah Bruce is a writer, photographer and avid traveller always on the search for adventure.